Dai Fujikura, the London-based Japanese composer, has launched his own record label, Minabel Records, for recordings of his own works. 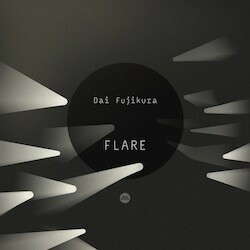 The first release under the new imprint is Flare showcasing seven of Fujikura's chamber works, performed by the Arditti Quartet, Vox Humana, Masanori Oishi, Mari Endo,Kenji Nakagi, the Goldfield Ensemble, Johanna Persson and the Zilliacus/Persson/Raitinen Trio. Rather impressively five of the pieces are recorded live. Though Fujikura was born in Osaka, Japan, he has lived in the UK for more than 20 years and he studied composition in London with Edwin Roxburgh, Daryl Runswick and George Benjamin. In his music Fujikura is fascinated by the forms and patterns observed in the natural world, patterns of synchronised movement and geometric precision. On this disc, this is reflected in the way the textures of the pieces develop, transmute and fragment as Fujikura uses often advanced playing techniques to create patterns in sound. Flare (2010) was recorded live by the Arditti String Quartet. The work was inspired by memories of sitting by a campfire as a child, mesmerised by the process of burning. The work gradually transforms from the percussive bursts at the opening to the softest articulations at the end. The opening is edgy, with its combinations of arco and pizzicato (with the composer also introducing col legno later on), melody is fragmentary at best, it is the sound texture that counts and the way it changes. The movement has intense energy, with strong forward rhythmic thrust. Hidden amongst the complex layers are some lyrical moments, fragments which hint at the 20th century string tradition. But, I fly (2005) was written for the Japanese choir Vox Humana; it is written for 12 voices. The performance was recorded live, conducted by Ryuta Nishikawa. Fujikura set a text created by Harry Ross, but words are almost incidental here. It is the poly-rhythmical textures which count, as Fujikura sets to explore the vocal possibilities of multiple voices and sets them against each other. Sakana (2007) was written specifically for the saxophone player Masanori Oishi, who plays the piece on this recording. Fujikura tailor made the work for Oishi, exploring the limits of what was possible. Fujikura consciously chose to write softly for the saxophone, challenging our perception of the instrument as a lout on. The result is a busy, eerie piece where the use of harmonics and other techniques make it difficult to believe that no electronic manipulation is used. Quite an amazing piece. Dolphins (2010) is written for two cellos, played here live by Mari Endo and Kenji Nakagi. Again Fujikura uses extremes and harmonics, combined with some intensely dramatic writing. The overall feel of the music does evoke something of the feel of swimming and diving. Halcyon (2011) for clarinet and string trio is played by the Goldfield Ensemble. A high solo clarinet surrounded by strenuous strings, with burst of energy alternating with stasis. The clarinet writing uses advanced phonics, often over Fujikura's beloved plucked strings. In the piece the composer wanted the music to sound as if manipulated using electronics, and it does! Flux (2010) is for solo viola, played by Johanna Persson. In this piece Fujikura eschewed his favourite pizzicato and instead explored the limits of the possible with a boa, even going so far as to notate the rhythms before the pitches. The piece has a wonderful rapturous feel to it, even though the music remains edgy with a deliberate awkwardness to the writing. The viola's tessitura gives a mellowness to the lower register. There are moments when it is difficult to believe there is just one player and, recorded live, Persson is technically brilliant. Scion Stems (2011) for string trio is played by the Zilliacus / Persson / Raitinen Trio, again recorded live at the Punkt Festival in 2011 (where Persson also recorded Flux). Starting with multiple trills, the programme note likens the piece to a swarm of bees, congregating, dancing and then separating, though Fujikura says he simply wanted to start with one texture and transform it into different ones. Again we have a rapturous feeling to the music, albeit with a strenuousness to and textures are clearly very important here, the way they intersect and transform. In each of these works Fujikura explores his chosen forces to their limits taking his players to the edge. And all respond brilliantly giving a series of fascinating performances. Fujikura does not write easy music, each piece on the disc requires care and attention from both performers and listeners. But the results can be magical. The disc is available for download, further details from Minabel Records Facebook page.